I think I have a high tolerance for repetition. Doing the same things over and over is just part of my job as a mom. Every day the beds must be made (mine, not the boys’s…I gave up on that a long time ago), dishes need cleaning, meals prepared and on and on it goes. There’s weekly laundry and floor cleaning, and monthly chores. Add spring cleaning and fall leaf raking. The list goes on. It’s a never ending cycle of tasks that keep repeating over and over, year in and year out. I’d be lying if I said it never bothers me, but most of the time it just is, and I keep moving forward to getting one more thing done for the day. I never thought much about it before but one of the key aspects of the art of pysanky is the way designs repeat over and over on a single egg. 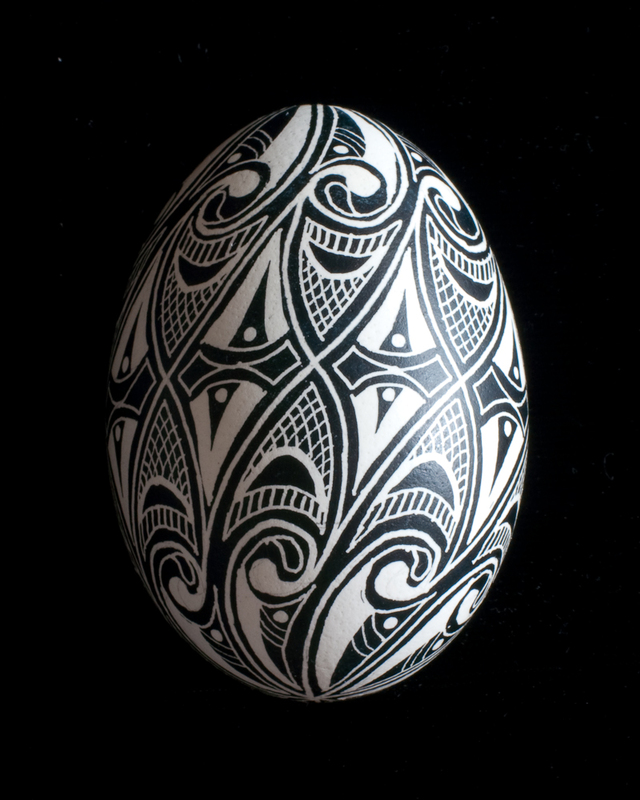 The beauty of the finished egg has a lot to do with its symmetry and the comforting cycle of patterns stretched over the constantly changing curve of the egg. This repetition not only gives the viewer something predictable to expect and enjoy but it also gives the artist a chance to get it right through practice. As an artist, if I never have to repeat anything, I never get to improve my technique, refine my hand/eye coordination, expand my use of color, or give free flight to my imagination. Repetition can be a prison if I allow it to, but it can also be a teacher and a friend…in art and life as well.